British fans of Japanese RPGs that feature Disney characters rejoice - Kingdom Hearts 358/2 Days will be released for DS in Europe on 9 October, Square Enix has just announced. In this game you control Roxas from Kingdom Hearts 2 as he tries to discover more about his days as a member of Organization XIII. Clearly then, the game will hope to answer those questions left unanswered in the brilliant KH 2. 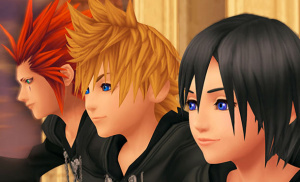 A new feature for the game is that you can team up with friends, choosing your favourite Organization XIII member and fight together, however the multiplayer gameplay is separate from the single player story and will be mission-based, which includes cooperative and competitive player battles. Personally I think the Kingdom Hearts games are a great little series, and it’s good to see the continuation of the story onto the DS. What's next? Kingdom Hearts 3 Wii? aww..the Brits gets it First..
Isn´t this a European Release Date?? When will it come to Germany and the rest of the Countries? Damn. I was hoping it'd be on September 29th like in America . It'd be a week after my birthday then . Awesome. @RGVEDA Update: Actually yes it is. The release date announced in the article is European. I certainly can't wait for this! I've been pining for more Kingdom Hearts goodness since I beat KH2! That is good news for you guys! It won't be long for Americans and Europeans! Well, thats not too long a wait for you guys. I personally can't wait for this game. I'm a big KH fan. @ Leon The Lion Welcome. Hope you enjoy the site. If they release the next Kindom Hearts for the Wii, I'm going to have a good time! I just recently participating on the blogs and I have to say that you guys of nintendolife really work hard. There are updates really often and while you are not radical fanboys you always have respect when pointing the negative points. Great Job! I reckon the next Kingdom Hearts would probably be on the PS3. Still, A Wii version that was a proper game for the series (and not necessarily KH3) would be fine for me and not just some boring spin-off. Personally I'm curious about this one for the DS. I want to know what happened with Roxas and the XIII while Sora was sleeping. I'm looking forward to 358/2 Days and Birth by Sleep.